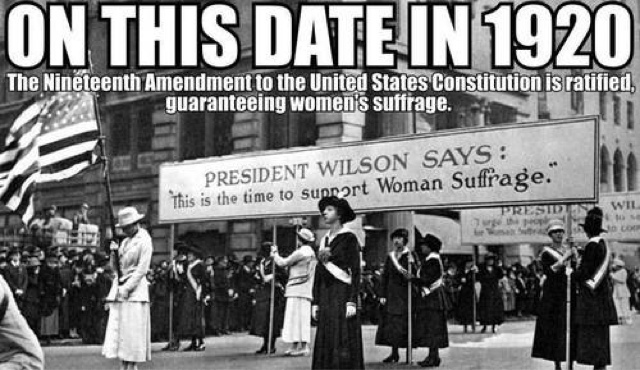 On this day in 1920, women received the right to vote. But some of you still don't do it. Why? Because you hate politics? That's a dumb "reason." And yet still others of you vote exactly how your husbands or fathers tell you, without any independent thought or research on your own... or even if you DO research, you still defer to the opinions of some man because you assume he knows better or because you don't want to "rock the boat." Once again, dumb. We have this right. We should exercise this right… wisely. That means do your own research [whether you like politics or not is irrelevant] and vote your own economic, social, and other self-interests. Demand that your elected officials (whether or not the person you voted for) be held to a high standard. Don't let anyone tell you how you should vote—not your father, not your husband, not your best friend, not some pundit, and not some blogger. Prove that we deserve this right.